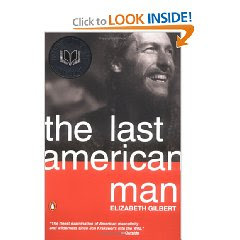 Elizabeth Gilbert’s “The Last American Man” cemented my age-inappropriate crush on older, bearded men. Beards and the men who sport them convey a sense of woods savvy, resourcefulness and self-sufficiency. Imagine my delight when I found Eustace Conway, a bearded man who in addition to a great storyteller and hunter is still a part of the natural cycle of life. Conway recognizes that resourcefulness is next to godliness. “Thank God there was one truly resourceful and independent wild soul left in this country,” Gilbert writes. Conway, for Gilbert, signified that America was a nation where people grow free and wild and strong and brave and willful instead of lazy and fat and boring and unmotivated. The story of Conway, Gilbert maintains, is the story of American manhood. Shrewd, ambitious, energetic, aggressive, expansive – Conway stands at the end of a long and illustrious line of the same. Living outside of the softening and vision curbing influence of the city, Conway wakes up every morning to a national crisis. He sees America as an impotent nation reflexively ruining everything in its path. Reduce, re-use and recycle are good concepts, Conway says, but those three concepts should be last resorts. Rather, he says, the focus should be on two other R words – reconsider and refuse. True to her journalism roots, Gilbert unflinchingly captures many sides of Conway’s personality. She bills him as an old-time mountain man and radical land and water conversationalist, not a wimpy hippy encouraging people to take off their clothes. While he preserved what was dear to him by buying a forest with a complete watershed inside of it and opening up Turtle Island Preserve in North Carolina, Gilbert also portrays him as a perfectionist workaholic with a host of broken relationships that are testament to his wicked, uncontrollable temper. Gilbert’s book is a fascinating read and Conway’s drive to influence others to adopt some of his values or lifestyle will stay with you months after the last page.